My family and I really enjoy baked goods. I enjoy baking myself but to find the time can be a little hard. So, when I find a company that offers amazing baked good items I am really happy. It allows my family to enjoy amazing baked goods without having to wait for me to find the time to bake something. I had the chance to work with Butterfly Bakery and they were kind enough to send me two different types of muffins that my family really enjoyed. Live deliciously with Butterfly Bakery. 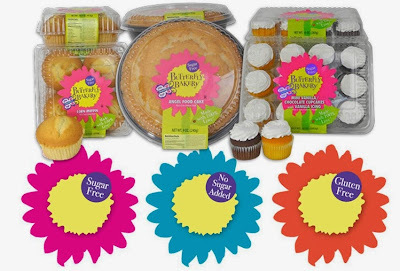 Their SUGAR FREE, NO SUGAR ADDED and GLUTEN FREE baked goods will turn your dietary restriction into a dietary indulgence. They offer 75 Different varieties of Sugar-Free, No Sugar-Added, Gluten-Free and Whole Grain baked goods. During my review, I received the Gluten Free Blueberry Mini-muffins and the No Sugar Added Blueberry Corn Muffins. I first tried the No Sugar Added Blueberry Corn Muffins. These muffins taste great and are perfect for a nice snack in the middle of the day. I personally liked the muffins even more when I put them in the microwave and warmed them for a few seconds. I then tired the Gluten Free Blueberry Mini-muffins. The kids really seemed to like these ones the most. I like that they were mini muffins, which makes them great for the kids to eat in the morning before school. They tasted great and were moist and the blueberries really added a nice flavor. I think the Butterfly Bakery offers some tasty baked goods that everyone in the family can enjoy. The flavors of the items are very tasty and the items are priced nice too. About the company: In 1998 founder and CEO Brenda Isaac had a dream to create sugar free baked goods that her diabetic mother could enjoy. And so Butterfly Bakery was born. Sugar free eaters, calorie counters, gluten intolerants and skeptics agree, once you taste the rich creamy distinctive taste of Butterfly Bakery you will never turn back. Our Sugar Free and No Sugar Added baked goods are sweetened with milk based lactitol, for a rich and creamy taste with no digestive side effects. For Gluten Free we use whole grain Teff flour: Naturally sweet, light and moist, full of potassium and fiber. What makes our cakes, muffins, cupcakes and cookies so good? It’s love, baked right in. Where to purchase: You can make a purchase from the Butterfly Bakery website.